Where else but the west coast can you refinish furniture outside in January - no rain, pretty mild temperatures... Very kewl! This Saturday, I dragged this piece out on the deck. I bought it a few months ago for $20 and am really excited to see it without paint. I spent maybe 2-3 hours on Saturday scraping paint off. This may be the easiest furniture update I've done thus far. A lot of the paint came off with minimal effort. I think I can finish this piece next weekend - I just need to finish scraping the paint off then sand it. I'll let it sit for a bit after the stain then I'll seal it. 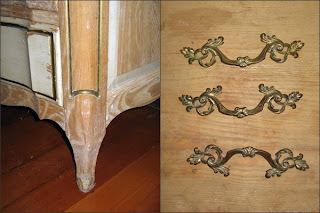 On Sunday, I took off the drawer handles and polished them. I want to re-use the handles instead of replacing them. I'll see how they look once the piece is done then decide if they need to be replaced but I think they should look A-OK. I was checking out other before & after projects online. I'm 99% sure I want to keep the finish on this piece au natural. It's really nice wood and with a stain could look amazing. I was looking at this desk update on Design*Sponge. The finish is very simple but definitely brings out the details. 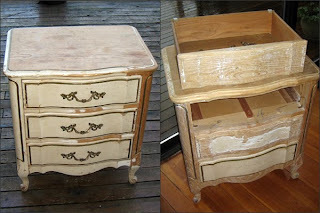 But then I was completely wow-ed by this dresser update - also on Design*Sponge. I'm not a big fan of painting quality wood but this piece looks very kewl. 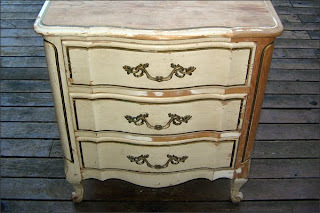 So I was a bit tempted after seeing the dresser update to paint my side dresser but gosh darn it I'm going with plan A. And feeling very good (and super excited) about it. As you may have guessed - there was no sewing happening this weekend. But I did review my big list of unfinished furniture projects. Boy it's a long list but I am committed to working my way through the list this winter/spring. 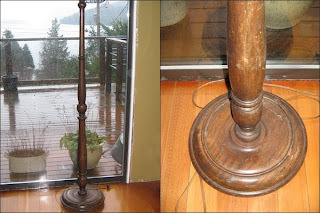 After the side dresser, I'll be working on the mahogany floor lamp I bought at the Happy Cat Haven last summer. It was $7 - the mahogany needs to be refinished and the lamp shade needs an update... And then my Dad will help me rewire it. 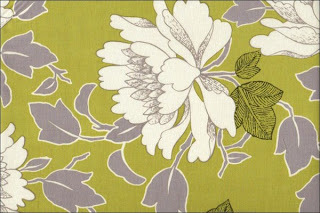 I've found an Amy Butler fabric I want to use for the lamp shade update. It's at Carola's Quilt Shop - this funky fabric store in Gibsons that stocks a bunch of Amy Butler's fabrics. I'll pick up a metre of the fabric in the next week or so since they have a sale coming up. I didn't want anything too wild - I wanted something a bit fun and yet earthy. 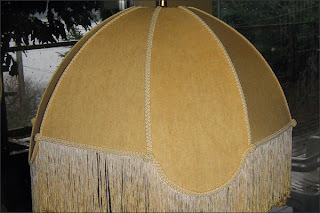 I think the fabric below will work with the lamp shade... I'm not sure about adding the trim. It seems a bit too much but I may have to once I've updated the fabric. We'll see! Signing off for now... Here's hoping for no rain next weekend then I can sand away! Oh, I just love that piece! The French provincial lines are just my thing. I've been loong for a pair of end tables like that for a while now. I know one will pop up at some point. Patience... Anyway, I can't wait to see how it turns out! Thanks! I love this piece as well. Today I'll be sanding it - I can't wait to see how it works out!